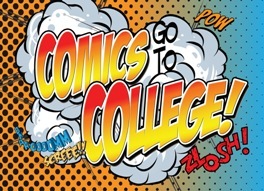 Comics go to college? What are graphic novels and why have they appeared on this university campus? Join us on Wednesday, Nov. 11, as an award-winning comics writer, a college professor who teaches graphic novels, a writer-illustrator, and a grad student / comic book writer talk about the world of graphic novels. For those interested in browsing, comics and graphic novels will be on display. The thought-provoking panel discussion will take place from 4:30 to 6 p.m. in Falvey’s first floor lounge. Panelists include Jonathan Maberry, a multiple Bram Stoker Award-winning author and Marvel Comics writer; Mary Beth Simmons, M.F.A, director, Villanova Writing Center and ACS faculty member; Matt Phelan, writer and illustrator; and Brian A. Lynch, graduate student, communication department, and amateur comic book writer. In fact, over 200 scholarly articles on the graphic novel have been cited by the Modern Language Association’s International Bibliography. In April 2009, we posted a blog asking readers to comment on the genre of graphic novels and to make recommendations. This post generated many good comments, and we used the suggestions to help build our collection. Now, we are expanding our exploration of the graphic genre to include a display and this lively discussion focused on writing, illustrating and teaching graphic novels. The threatened demise of syndicated newspaper comics has created a rift in my reading world, but the good news is that, as the daily comics diminish, there seems to be an upsurge in the production of graphic novels. This pattern of seeing one format flourish as another diminishes is nothing new. In the online publication Image & Narrative, (Dec. 2000) , Chris Couch writes “In the Depression, as sales of newspapers decreased … the comic book [was] a way to increase the press’s business.” This time around, however, the increased production of graphic novels isn’t so much contributing to the “press’s business” as it is answering the public demand for alternative graphic format.